Let's face it. If there's any band that has this kind of staying power, it's our boys. Like me, you may have missed out on seeing John & John perform in the eighties, but at least we can still look forward to seeing them perform in their eighties. After thirty great years of They Might Be Giants, here's to an even greater thirty more years! Here we have the Johns as They Might Be appearing in the year 2040, illustrated by the great Tony Millionaire. John Flansburgh is wheelchair-bound, wearing old man glasses and has very little hair, the exception of course being inside his ears. He clutches an electric guitar, with no need for an amp in the futuristic world he now lives in. John Linnell, however is connected.. to an IV drip. He has his accordion handy as well as a bowling ball pattern of liver spots on his balding head. Both of the pale, fragile-looking men wear what appear to be hospital gowns and slippers, as if They Might Be Geriatric nursing home escapees who just busted out against doctor's orders to do just one more tour. You gotta admire that. 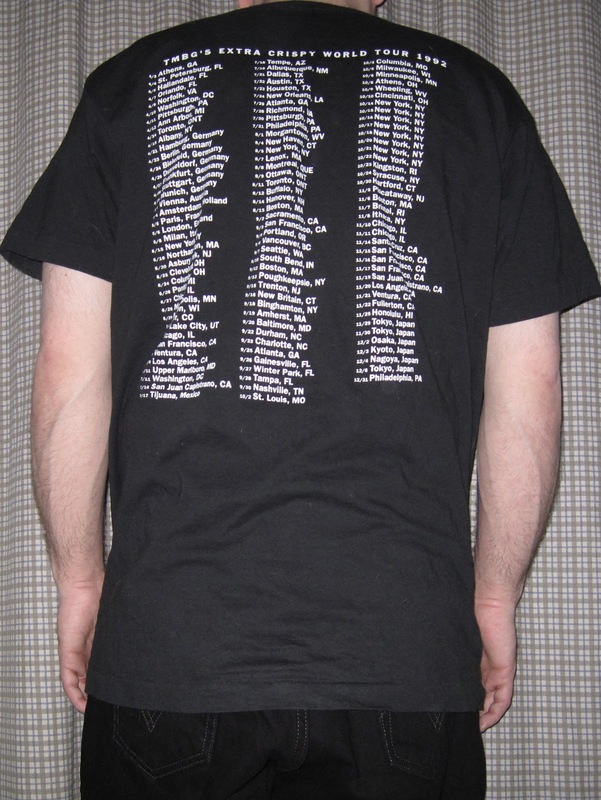 This "Tour Shirt" even includes the standard list of tour dates, venues and cities on the back. It's a grueling 22 shows in 24 days from January 13 thru February 6, starting in Asbury Park (Not the Stone, Stone Pone, Stone Pony but the Fast Lane) followed by New York, Pittsburgh, St. Louis, Branson, South Amboy, New Haven, "LA Island" which has apparently been separated from the mainland via The Big One and "People's Republic of Utah", who have seemingly succeeded from the union. They will also visit some foreign countries; Sweden is treated to four shows, followed by Germany, Ukraine, China and Japan. The tour culminates with three off-world concerts on The Moon, Mars and "Las Venus". Of course, I might be living on one of these otherworldly colonies by then; nevertheless, I plan on following the entire tour. See you there! In honor of TMBG's 2040 show at "Le Ace of Base" in Brussels, Sweden, here's John Linnell performing "The Sign" instead of the usual PM bridge. Performed on 10/23/97 at The Agora in Cleveland, OH, this version also includes the lyric "Particle Man hates Particle Man". 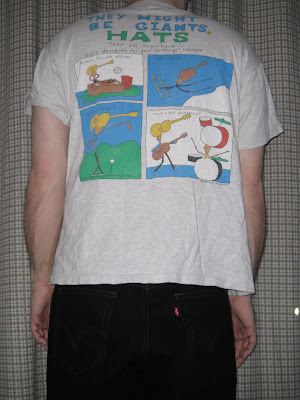 This week's shirt features "That Guy" that you've seen in some of TMBG's early videos, or perhaps as a backdrop at a live show. As you may know, his name is William Allen White. He was a Pulitzer Prize-winning writer and newspaper editor from Kansas who lived from 1868-1944. Why did John & John want some old guy in their videos, anyway? They're just weird. But why this old guy? Well, according to Flansburgh: "We wanted to use the face of Orson Wells, but were afraid we'd get sued." I think that at this point it's safe to say that TMBG is in no danger of a grudge being held by the estate of William Allen White. 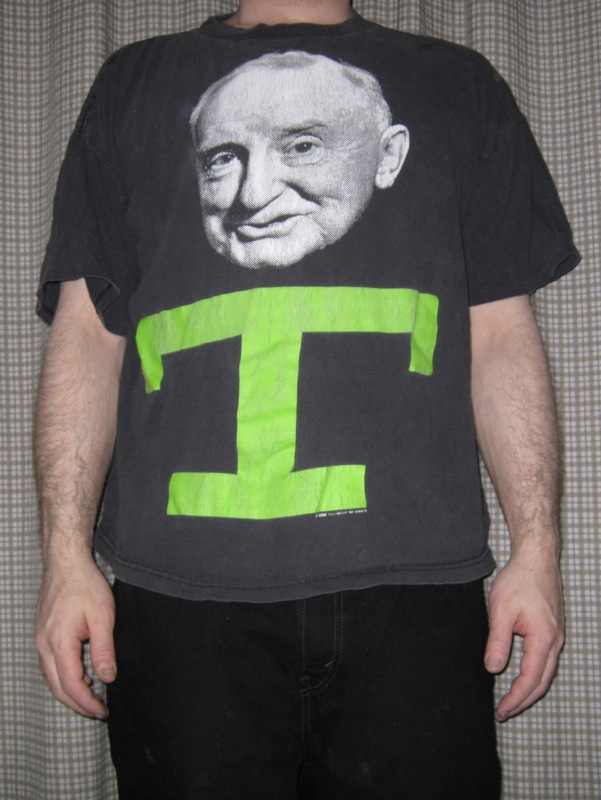 The front of the shirt displays the standard disembodied, floating head of Mr. White above a giant, florescent green letter T. When I walk around wearing this, onlookers stare at my chest and ask, "Who's that? ", to which I reply in an authoritative tone, "That's William Allen White." or if I'm feeling lazy, simply, "That's Billy!" and do not offer any further explanation unless one is asked for, which it often isn't. Here's Don't Let's Start, in case you're not familiar with how the band has used WAW in their videos. I wonder who they got to hold those giant WAW heads up and dance around (in slow-motion no less, so it would sync up with the music when the footage was sped up). Imagine being able to say, "See that Giant dancing head right there? That's me." Man, those people are lucky. Incidentally, my first ever exposure to TMBG was this video. On the back, a smaller WAW head accommodates the remaining three initials of our favorite band, this time in red. As you can see, this shirt does not fully convey its message unless both sides are read, and in the correct order. And even then, most people are left scratching their own head. As it should be. A few times, John or John decided to goof on the audience after receiving a big response to being told that they're going to hear a song about a president. This was one of those times: 9/12/97 at TRAX in Charlottesville, VA.
Entrant number three of the TMBG Shirt of the Week finds us with the shirt that inspired the project. Illustrated by Young Fresh Fellows drummer Tad Hutchison in 1994, this one wins the award for silliest shirt. "LOOKY AT THE NEW TOUR HATS! ", the top proclaims in colorful, capital letters with the O's in the first word enlarged to resemble eyes. In white at the bottom, "THEY MIGHT BE GIANTS" is printed and three slogans are featured in the center: "Style you can count on! ", "Quality you deserve!" and "Keeps head warm too!". What these signs are referring to are the three surrounding absurdly slim figures impossibly supporting on their heads what appear to be full-sized musical instruments. It's a three-piece hat-band with guitar, accordion and drums, the last of which seems to be precipitating some perspiration from its bearer. Nevertheless, he and his associates seem happy enough, with broad smiles and flat eyes hovering in empty space in front of their faces. 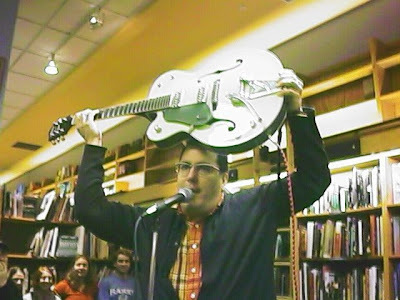 A few months back I was posting the photo of the day of John Flansburgh that I took an an instore in '03 in which I believe that he's showing off his newest guitar by holding it above his head. It reminded me of this shirt so I added the comment, "Keeps head warm too!". Somebody asked me to explain and I wanted to show them what I was referring to but had to settle for describing it because I was unable to locate a decent photo of the shirt anywhere on the Internets. That's when I first had the idea for this weekly t-shirt deal. 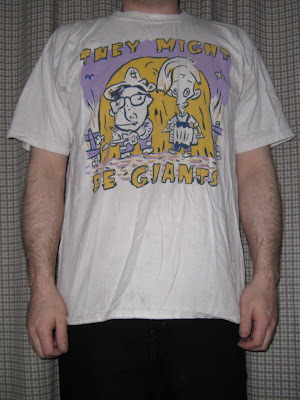 The back of the shirt reads, "THEY MIGHT BE GIANTS (R) HATS" followed by "Take 'em anywhere!! Hats designed for your 'on the go' lifestyle". What follows are four ridiculous panels that depict some great examples of activities one might partake in while wearing this fabulous headgear. We have "Perfect for the office! ", "Ski trips! ", "Golf outings!" and of course, "Rock n roll concerts!" with the guitar player and drummer wearing what else but guitar and drums on their respective heads. Now that's rock!! TMBG goes ahead with a Tower Records instore performance in New York City on 10/16/98 without John Flansburgh, who is feeling under the weather. They do have some horns, so this classic from the Edgar Winter Group is attempted, and here's the amusing result. Here's my favorite tour shirt. We all know how death is such a prevalent TMBG theme, so why not go all the way? After all, anything worth doing is worth doing right. I don't have nearly enough black TMBG shirts, so I was happy to see this one for sale at the merch stand at the Celebrate Brooklyn! Festival in 2000. This is when I found out that occasionally some old shirts are unearthed at the warehouse and subsequently offered for sale at a New York show. Sweet! 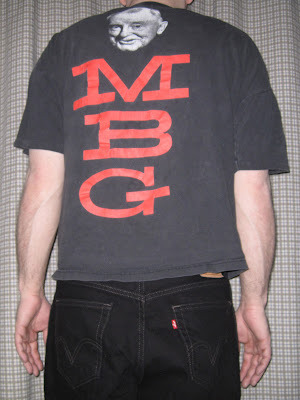 Later on that day, I saw Dan Miller get his own TMBD shirt, and I'm pretty sure that he actually paid for it. 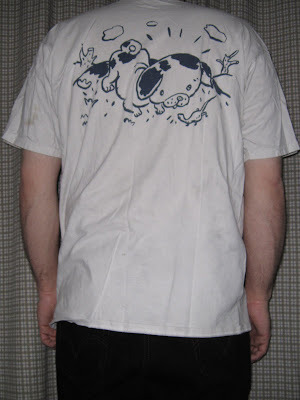 He seems to enjoy the shirt so much that he has worn it to several shows, including the performance that was shot for Gigantic: A Tale of Two Johns. 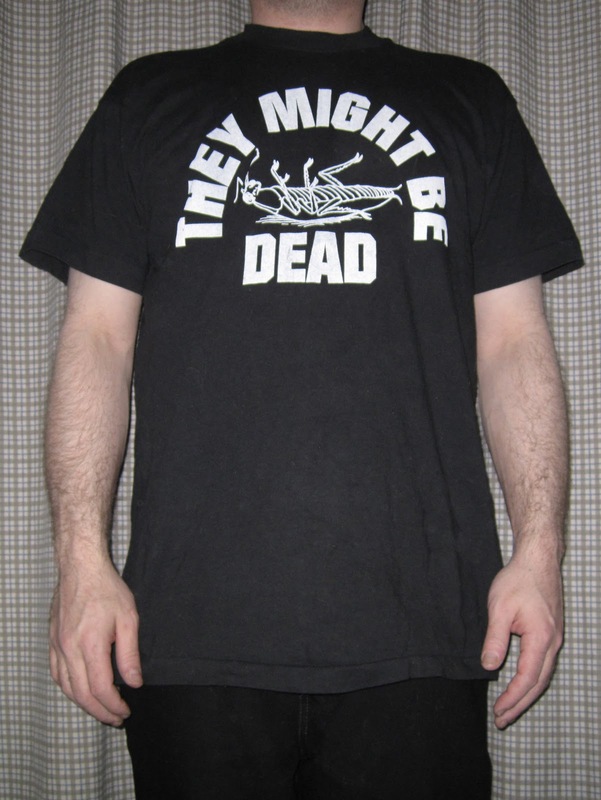 In the DVD commentary, John Flansburgh mentions that They Might Be Dead is their worst-ever selling t-shirt; I guess a big dead cockroach will do that. This shirt does pop up on eBay from time to time if you're into that kind of thing.. I know I am. Anyway, here's a bonus video from the DVD of TMBG performing TMBG. Watch the left side for Miller in TMBD. 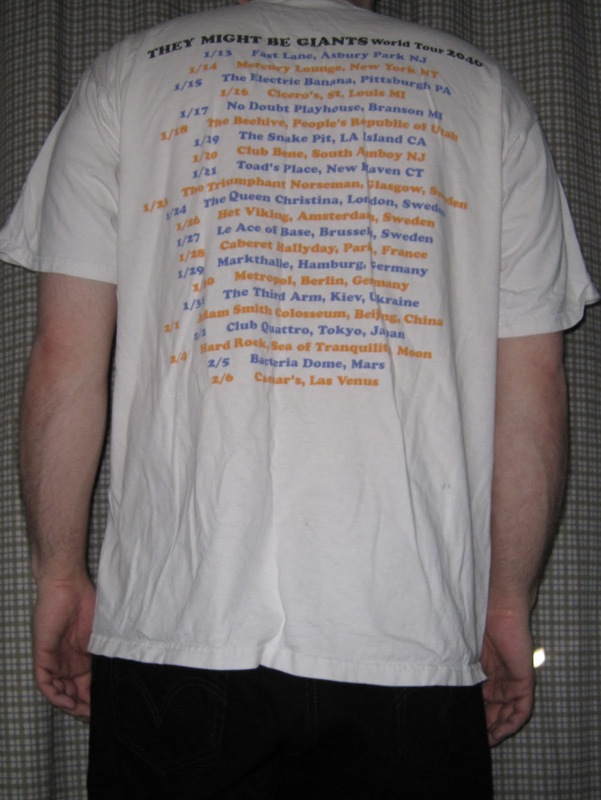 The back of the shirt reads "TMBG'S EXTRA CRISPY WORLD TOUR 1992" followed by a plethora of tour dates and cities. Sadly, I did not start attending shows until the following year and thus did not attend any of the shows listed. It's a good thing that I can't see these dates while I'm wearing them, because if I stare at the seven-NYC-shows-in-eight-nights for more then a few seconds, I start to drool on myself. 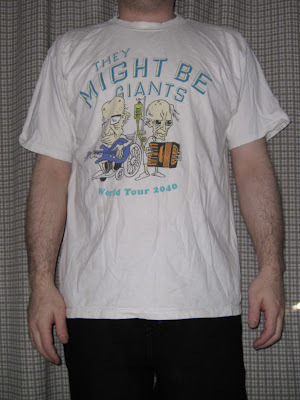 I particularly like that nowhere on the shirt does it actually say They Might Be Giants. A little extra ambiguity can go a long way. See you next week! A short cover of a song originally by 60's Australian folk band The Seekers, performed at Toad's Place in New Haven, CT on 4/16/98. 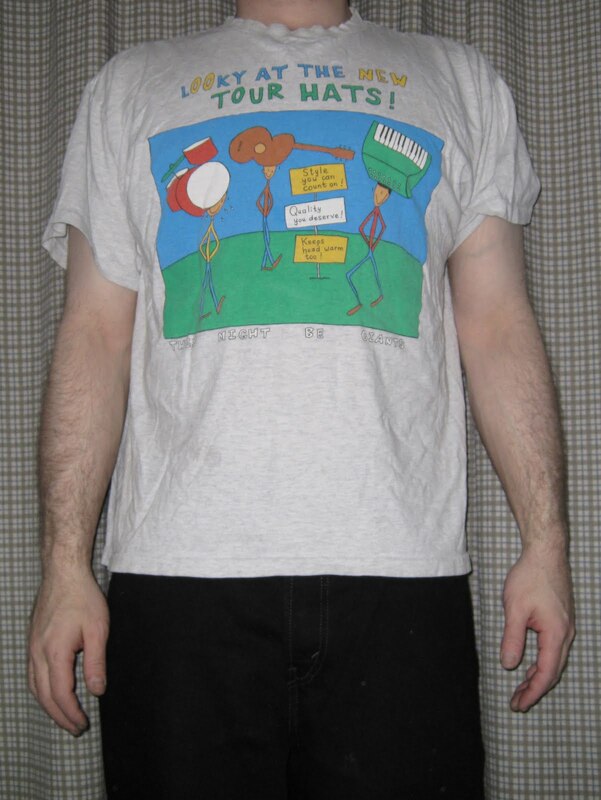 This shirt holds a very special place in my heart, as I purchased it from the merch stand at my first TMBG show on April 28, 1993 at the Count Basie Theater in Red Bank, NJ. Well, not this exact shirt. This is the replacement that I acquired much more recently to supersede my amazingly worn-out original, which is now unwearable yet lovingly kept in a safe place. I wore that shirt very, very often. 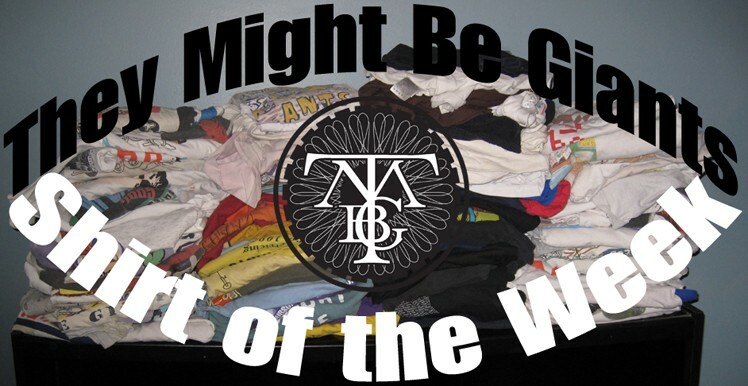 It was my first TMBG shirt, so it seems fitting that I make it Shirt #1 on this blog. The front of the shirt, a drawing by Mark Marek, depicts the Johns as a band hailing from the south. They Might Be Hayseeds, complete with large haystack and picket fence. Chewing on a hay stalk, Flansburgh is wearing a funny farmer's hat and knee patches while disproportionally taller Linnell sports bare feet and overalls. On the back, Mark pays homage to an illustration by Gustaf Tenggren on the cover of the classic childrens' book The Poky Little Puppy, one of the many "Little Golden Books" that was read to me as a child. The fact that I immediately recognized this image probably played a part in my decision to choose this shirt as my first. "An all-time favorite" is how this shirt is tagged in the online merch store, and I could not think of a better description. Currently being offered is the new 20th Anniversary edition, which features a small version of the Puppy and TMBG's time-tested slogan. That's right, kids! You, too can wear Hayseed Johns for just $25. I have chosen nine other personal favorites to occupy the first ten weeks of this project, in no particular order. After that, I will be picking shirts at random, or possibly by request. See you next week! A performance of the Back To Skull sequel song featuring the patented Flansburgh Falsetto @ Mercury Lounge in New York City on 3/28/96.